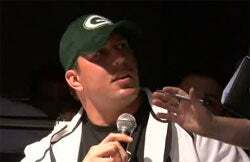 New York Giants lineman David Diehl makes his comedy club debut by mocking Brett Favre—and doing a pretty good job of it, actually. It was such a spot on impersonation that he even told his jokes to the wrong audience. Video below.